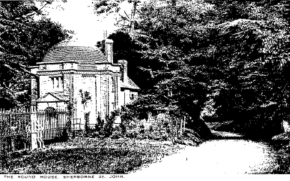 The red bricked Summerhouse was built around 1632 in the classical style. The domed roof and Greek cross floor plan is possibly one of the earliest examples of this style in Britain. Originally it was a shelter from where it was possible to admire the garden. In the 17th c. it was a Banqueting house – the family would use it for the final course of a meal, having taken a stroll in the garden after the main courses. In the 18th c., when tea was expensive and used for important social occasions, it was a Tea House (as shown by the 1754 and 1776 inventories). During the 19th c. a vent was inserted in the dome, the fittings stripped out, and the Summerhouse was turned into a pigeon house or dovecote to provide fresh meat and eggs during winter months. 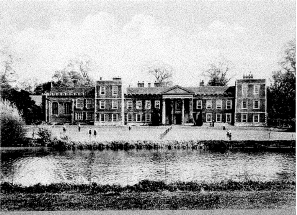 In the 1920s, The Vyne was a girls’ school. There were tennis courts on the North Lawn and vegetation growing up the pillars of the Portico and the entrance drive was lined by bushes. You can this illustrated in the images below. Here you can see a very different layout in the West Garden. In this period it was called the Pergola Garden. In the centre of the picture there is a sundial, the top of which is in safe keeping awaiting restoration. 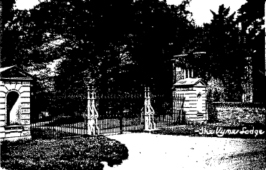 Here you can see a gateway entrance to The Vyne that probably existed between the times of the original entrance (via the Morgaston Road, through the woods, over the lake and round to the South Front) and the current entrance on Vyne Road. This entrance is by the ‘Round House’ which is between the current entrance and Sherborne St John. The gate pillars were obviously moved from here to the current entrance at some stage. The pictures appear to be from the 1920s. 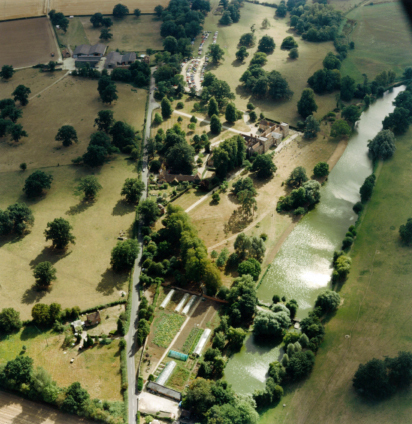 This aerial photograph shows The Vyne as it was around 1990. Note that the Carriage Bridge is no longer there, the car park is at the front of the house, the Walled Garden is still leased out to the Market Gardener, the banks of the Lake have recently been repaired and much of the more recent developments of the gardens (e.g. the Summerhouse Garden) have yet to be started. Also, it was a very dry summer when the photograph was taken – the lawns and fields are quite brown. The first mention of the grounds is in the granting, in 1245, of a license to ‘impark’, i.e. to keep a Deer Park to Robert de St. John. In this license it is known as Privet and Morgaston, representing a larger area out to, and including, Park Prewett to the south. For the granting of this much-prized license, King Henry III levied a charge of 100 marks, partly as a fine for Robert’s father who was imparking without Royal permission. It was Robert’s father who changed his name from William de Port to William de St. John and after whom the nearby village of Sherborne St. John is named. The Sandys family became the owners of the Vyne in 1386, but in 1420 it passed to the Brocas family through marriage. It then returned to the Sandys family in 1488 and was passed down through the family. William Sandys inherited the property from his father in 1496 and continuing his climb through the Courts of Henry VIII, became Lord Chamberlain to the Monarch. Very little information survives concerning the grounds in Tudor times, except for archaeological evidence of courtyards and outbuildings under the north lawn. This sprawl of buildings would have formed a complex twice the size of the present day building. A curtain wall surrounded the whole and the only remaining section forms the north wall of the Brewhouse. 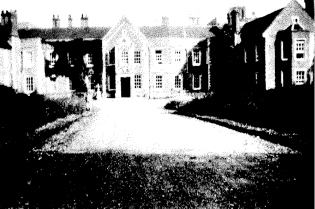 The house was sold to the Chute family in 1653, when the Sandys family money began to dwindle. A watercolour hanging in the house depicts a garden on the north side of the lake. In the foreground is a dog belonging to Anthony Chute (d.1754) known as ‘Chalon’. This would appear to be a formal garden removed with the emergence of 18th Century landscape designers such as Brown and Repton. Frequently, however, it was the landowner that would design the garden, as was the case at The Vyne. With the death of Anthony, his brother, John Chute succeeded to the property and with his grounding in the arts and thirty years spent in Italy, it comes as no surprise that upon his death in 1776 he left the garden much improved and altered in the 18th Century style. It was he who enlarged the water, built an ‘island’ and a wooden bridge. He had the walks cut in Morgaston woods and erected there a statue of a Druid, now removed. 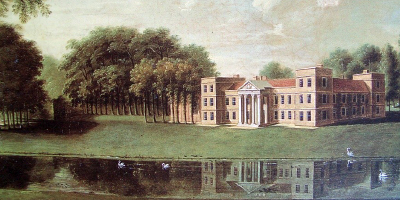 Caroline Workman who lived at The Vyne from 1803 described the garden some 30 years after John Chute’s death. There were two gardens, one called the kitchen garden, behind the present stables, and the lower garden called the flower garden. The latter was probably the present walled garden. 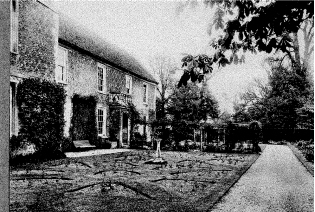 Wiggett Chute removed the kitchen gardens in 1888. The stables, which house the shop and the present garden equipment, were built to replace the Tudor stables, pulled down in the mid 1650’s. The building was, until Queen Victoria’s reign, two storey’s throughout. In the rooms above lived grooms, carters, coachmen and gamekeepers. 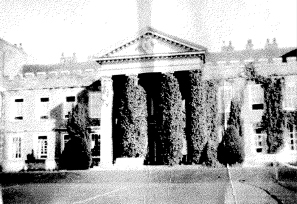 The estate was bequeathed to the National Trust upon the death of Charles Chute in 1956. With the help of modern day equipment combined with historical and tried and tested methods, the garden is now managed by three gardeners, with an extra gardener three days a week and between 15 and 20 garden volunteers. The garden staff and volunteers are always happy to answer any queries. Many thanks Alan. A lot of work goes into the site so It’s always good to learn that our visitors enjoy and value the content.